Lastly, we should note that the bent of this article is “strategic”: that is, it reveals a practically insurmountable limit faced by interventions of this type, in that moment. It proposed to construct a new relation between tactics and strategy, but as it doesn’t succeed in gaining a hold on the tactical level and the instruments needed to conquer this decisive dimension, it was constrained to tactically force strategy: “the coachmen flies?” 2 We weren’t primarily concerned with the contradiction of the intellectual who does politics. Rather, it concerns the frustration of every effort to open channels of communication between the Italian political system and the historically-pressing needs of the working class. Like many of the moments in Alquati’s writing which suggestively hint toward other histories, that mention of “old comrades” gets no clarification, and names aren’t named. Nevertheless, it takes little guesswork to figure out who he means. By 1975, both Mario Tronti and Massimo Cacciari had rejoined the PCI, following out their respective takes on the “autonomy of the political” (autonomia della politica) 4, a decisionist position that hinged on a grasp of capital’s incomplete rationalization and an assertion of political power as independent from the “rest of society” (Tronti). In terms of the condition Alquati is identifying (i.e. the “frustration of every effort” to forge relations and open communication between historical determinations of the working class and political organizations that are counter-historical, whether in the sense of “out of touch” or seeking to voluntaristically change the terrain), the position taken by Cacciari and Tronti in the early ‘70s valorizes and hypostatizes that recurrent failure. It mistakes a tactical consequence for a strategic one, declares the gap absolute, and sides with “politics” as a zone in which to assemble the fractured Ratio driving those determinations. The other “old comrade” from whom Alquati marked his distance seems to be Antonio Negri. While Negri’s work on Keynes didn’t see publication until the first issues of Contropiano in 1968, it is as crucial for defining and thickening the core of ‘60s operaisti thought as Tronti’s and Panzieri’s early work. Yet by the time Alquati is gathering his situational writings from that period for the collection Sulla Fiat (a project that gives him no small amount of unease), Negri has also extended a logic of separation to what is, from an Alquatian perspective, a totalizing and nearly ontological level. Consider, for instance, Negri’s position emerging in his thought through the ‘70s that fully crystallizes in his ‘78 Paris lectures on the Grundrisse (available in English as Marx Beyond Marx): that there are two historical subjects of capitalism, capital (in an at times slippery assemblage of both capitalists and the social relation of capital itself) and the working class. Practically speaking, this meant lining up on the opposite side of the split from Tronti and Cacciari, siding with the working class as subject of history untethered from the political sphere as defined by bourgeois civil society. But from the viewpoint of Alquati’s theory, this not only tends toward a kairos-ridden romanticization. Worse, it stands in danger of betraying the very antagonism on which it grounds itself, because it forgoes the very materials, structures, and circuits through which working class refusal – “non-collaboration,” for Alquati – becomes more than a fantasy of exodus: namely, the plan of capital (il piano di capitale) itself, the same sites, routes, materials, and processes, of which labor is but one, through which capital circulates. And for Alquati, we must recognize past failures and missteps where we see them, not take that specific blockage (the frustration of efforts to open communication) and declare it a general condition of class struggle to be justified in theory (be it the autonomy of the political or a two subject/separation model). Looking back, it becomes clear that while it was Negri and Tronti who talked a bigger game about sabotage and proletarian self-organization, doing so with a gusto and incisive style that’s undoubtedly bracing to read, it was Alquati, more than any other Italian (and perhaps elsewhere) communist thinker of that era, who actually provided the tools and research to ground it historically, through three critical moves. First, he generates the most lucid defense of the rationality and historical precision of struggles labeled spontaneous and apolitical – a rationality he terms the “invisible organization” which underpins the wildcat, the multi-workshop “unofficial” strikes, and the “descent into the piazza” (i.e. the riot). Second, he argues that this “invisible organization” inheres not outside capital or in flight from it but truly within: not just within the contradictions generated by capital accumulation but inside capital’s attempts to overcome those. This enacted attempt takes the name of rationalization and involves the seemingly contradictory processes of socialization (both “the objective elimination of individual work” and, conversely, the use of the individual worker’s creativity and knowledge to supplement the inconsistencies of the plan) and mechanization (the political control of labor by its routing through assemblages of fixed capital/crystallized social labor). The assurance that socialized and mechanized labor remains productive and fulfills the plan is managed horizontally by the bureaucratic functions distributed throughout the system (programming, control, and the organization of labor) and measured “vertically” by the non-productive bureaucratic apparatus (“the boss,” taken in the wider sense, and its employment of industrial sociology). It is precisely because of “passing through” the historical process of rationalization, and then witnessing the irrationality that continues unabated behind its cover, that workers both collapse the myths of productivism and have precise knowledge of the system they will seek to ruin (a knowledge that is the crux of sabotage, i.e. the turning of means against their designated ends). Third, he treats theory not as the revelation or creation of this perspective but as accomplice and aide to the extant force and knowledge of that “invisible organization.” Because for Alquati, the labor of inquiry and writing is to help articulate – the word he uses to indicate the first step in discerning the obscure social forces mapped by discrete instances of rebellion – what’s already at work in class insubordination. As he writes in the introduction to Sulla Fiat, “In these articles, I tried to transform theory into political organization capable of socializing itself and of growing subjectively within the quotidian practice of the mass movement of the working class.” (Alquati Sulla 10) In other words, his theory does not prescribe a plan or describe organization to come. Theory is the name for a process of research and practice that seeks to generalize the process of class composition, one already taking constellated shape not in the working class itself as a subject but in those moments of non-collaboration, in order to amplify them into a communication of class refusal across sectors, territories, and populations. Yet those moments and communications do not begin ex nihilo or in exile. Instead, they hijack the architecture of capital circulation that has historically determined them. They exploit capital’s determination of the factories, piazzas, houses, and all the zones between as a network of propulsive nodes and established paths through which to structure itself as an extensive force of material and social negation. So too Alquati’s theory, which insists on setting itself firmly behind enemy lines, reading the “data of the boss” against the grain and raiding the toolchest of industrial sociology for militant ends. Like most Marxists, Alquati insists on the mutual necessity of theory and practice, but unlike a lot of them, his own theory provides the actual justification for this being so, coupled with a necessary honesty about the limits of its scope and a willingness to acknowledge errors. That’s a tendency there from the start: toward the conclusion of his pathbreaking “Report on the ‘New Forces’” (1961) that appeared in the first issue of Quaderni Rossi [Red Notebooks], he writes that, “All these arguments are, in a certain sense, double-edged swords, all carrying a reformist edge that will totally dominate if that edge remains isolated, if political work isn’t carried forward at the same time, in all of the various moments of dynamic interaction it composes. All these aspects of the Italian situation today can be very easily misunderstood” (52). Which is to say: the arguments themselves will become wrong – i.e. reformist, and therefore inadequate to the historical verification of class antagonism – if they remain isolated as arguments without political work (i.e. the process of articulating composition from disparate moments). That political work is not, therefore, an appendix or proof. It alone is what makes the theory a weapon, rather than apologia for the current order. Alquati will never pretend otherwise. His work is not to drive or direct struggle. Rather, he wrote “for the pressing necessity of experimentally joining political operativity with a means of communication,” to provide a framework that will be driven forward by that political work and which will offer in return a distillation of the history that rebellion has already been making (23). Given all this, the fact that Alquati remains unknown to English-reading Marxists isn’t a shame solely for reasons of historical completeness. It’s also a real loss for the present, because even more than the other operaisti (and infinitely more than certain “post-workerists” busy whipping frothy peaks of the immaterial and immanent), Alquati’s dense research into eddying flows of value creation and the antagonistic force of what doesn’t appear “political” is of particular relevance in this alleged age of riots and networked socialization. Yet he is even less read than the others mentioned above, who themselves, with the exception of late Negri, remain far more referenced than actually read. The aim of this introduction is therefore plain: to provide materials for an initial reading of Alquati. It is neither a guide to the specific translations Steve Wright and I have done, which, like all his texts, introduce themselves amply, nor it is an overview of his expansive historical interpretation. Rather, drawing on selections from a range of his other essays, it offers a consideration of just what his project of writing and inquiry aimed to do, a development of a initial historical framework to help situate that project, and a definition of his singular terminology through which a reading of these essays will be more comprehensible and, I hope, more generative for present communist research. The peculiarity doesn’t end there. His essays obsessively qualify and repeat themselves, if not ad nauseum, then ad infinitum, studded with the same words over and over, often in a single sentence: politica, operaio, processo, padrone, and always lotta, always struggle. Yet this, and so too those distinct swerves in tone and register, belong to a strangely generous difficulty. Alquati may be, and surely is, hard to read, but just as he treats each text he wrote as an instrument of extension designed solely for the specific inquiry it elaborates, he would never write, for instance, “in the Marxian sense” without explaining just what would be meant by that in this exact instance. He doesn’t refer to Capital offhand: he pinpoints chapters, passages, and precise terms. He doesn’t talk about “the FIAT workers,” at least until he has laid out the sectors at the factory, the history of their wildcat strikes, and, most importantly, what those workers say about themselves and their history. He wasn’t unaware of his texts’ difficulty, insisting that, “I never said I would write for everybody.” Fair enough, but at times, it seems he writes for nobody. (And not in the prefigurative sense of a communist non-subject to come…) At least a portion of the inattention given to his work has to be laid at the feet of his prose. Sentences reel off for a paragraph at a time, forfeiting punctuation when it would clarify and throwing in semi-colons when things are moving along just fine. 9 Unwieldy strings of technical terms and well-polished Marxological bundles – the development of the cycle of accumulation of the product of living labor… – pile up like siege engines in a traffic jam. And then there are the scare quotes. That said, I’d suggest that the repetition of those punctuation marks, obnoxious as they may be, indicates something of actual importance. They’re the indexical traces of both a precise critical practice and a real historical torque that any communist theory worth the name cannot but register. In the case of the quotation marks, they appeared in his first articles for Quaderni Rossi for a very specific end: to demarcate what were not his own words but those spoken by workers in inquiries and co-research. Perhaps the closest analogue to this method, other than Danilo Montaldi (the Italian pioneer of militant sociological inquiry, yet another figure deserving of more consideration abroad), is the docu-fictional assemblage of Nanni Balestrini – far better known than Alquati in English – in his “novel” Vogliamo Tutto (1971), where Balestrini montages his narrative, and its peculiar rhythms, from a long record of one Southern-born worker’s spoken account of Northern factory struggles. The search for new structure of research and articulation is not, in Alquati’s case, an academic one but a response to major and drawn-out shifts in the Italian situation. These shifts, which can be periodized with relative clarity from the end of the war, the reorganization of the national economy, and the subsequent “economic miracle,” are well-known: massive industrialization, particularly based on the explosion of consumer durables; internal migrations of contadini, especially young men, northwards toward the cities of the Industrial Triangle, unparalleled for speed and scope in European history; the consequent scrambling of established labor hierarchies in the large firms of those cities; the extreme exacerbation of urban crowding, sprawl, and abusivismo (land speculation and illegal housing construction profiting off the decent intentions toward zoned urban development plans), coupled with careful integration of those populations and zones into a circuit termed the city-factory (città-fabbrica) by Alquati; the simultaneous swelling and defanging of the PCI, whose compromises with the Christian Democrats was as ill-advised as it was to be politically disastrous; and the development of what was termed neocapitalism, designating advanced levels of coördination both between capital and unions and between sectors of industry (via Confindustria, for example). A capitalist frolics in the economic conjuncture. As a rejoinder to the last condition, that historical perversion of alleged communists and captains of industry joining together to manage labor under the sign of its “nobility” and necessary contribution to a project of national reconstruction, Alquati gave an appropriately perverse name, dubbing this emergent system the “ordinovistico” project of capital. 13 The term, by no means common amongst the operaisti or anyone, refers to a weekly paper started in 1919, L’Ordine Nuovo (The New Order), by Gramsci, Angelo Tasca, and Palmiro Togliatti (later PCI head). Pushing a councilist left communism, it argued that factory councils could form the fundamental cell through which to build toward revolution. Bordiga criticized the position as syndicalism, and it was dropped by Gramsci in coming years, until being adopted, Alquati suggests slyly, by capital itself several decades later. A joke of the bleakest order, it suggests that, much as Negri read in Keynes the effort to no longer deny the subjectivity of the working class – and the necessarily antagonistic quality of that subject – but to neutralize it and use it as a spur for development, so the ordinovistico project consists of the open acceleration of the socialization of labor. It is “political control” as “control of struggles,” the most advanced form of which is, paradoxically, worker “self-control” itself, meaning not just the “institutionalization of workers’ self-management” but also an ideology of autonomy that cannot recognize how struggles of self-determination are struggles for the continuity of the plan of capital. Gramsci’s ordinovistico pleas for, “the organic unification of the labouring class,” that “homogeneous and solid foundation [on which] will flower and develop all the superior structures of the communist dictatorship and economy” requires hardly a half-twist for capitalist integration: just swap “capitalist” for “communist,” because post-war productivism, from unions to bosses to FIAT training courses, will all speak this language of development and unified base. 14 And beyond the seriously torn veils of “specialization,” 15 that productivism will urge the same project of “organization by factory” – be it through work-teams, the “myth of FIAT,” or Olivetti’s “human” face – which Gramsci believed, for rather different reasons, “makes up the class (the whole class) in a homogeneous unity.” In the ordinovistico years of capital, this unity becomes abject for believing its “self-control” at odds with this social integration, a tension Alquati sees also in the blurred gap between “collaboration” between workers, even toward ends of self-management, and the worker “coöperation” that’s “commanded” in the large plants (and forms the coercive basis of the “social” character of labor). The primary mediating organ of this self-control is, of course, the union that ennobles it. And the name for the individual units of the socialized factory’s “homogeneous unity” is none other than the operaio massa, the “mass worker,” the element of operaismo best known in English. We can note here two themes crucial for understanding Alquati’s whole project. First, the insistence that those “young forces” – variously labeled as “disorganized,” “spontaneous,” “undisciplined” (as with the later accusation of extraparliamentary communists as cani sciolti, “wild/unchained dogs), “unpolitical,” “individualistic,” and, above all, “terrone” (a pejorative term for Southern Italians) and “subproletariat” – were not the “residue” of an older order in transition, nor the turbulent eddies of the population streaming northward. Rather, they were a new subject marked, above all, by a passage 17 through new conditions of production. The “mass worker” is not an unskilled manolavoro (a manual laborer, in the agricultural or artisan sense) who happens to find himself in the factory. It is necessarily plural (the “young forces”) that, taken in the singular form, is the basic unit of abstract labor needed for the new flows and arrangements of production managed in the factory, and, taken en masse as a social and historical force, emerges from the empty husk of the outmoded skilled worker, tossing off those structures of institutionalized mediation to which its “host” had long been accustomed. Here, though, an expected impasse emerges that curses the thinking not just of Alquati but the entire operaismo sequence: the inability to actually extend the logic of the città-fabbrica to include either the home or any serious consideration of unwaged domestic labor. To seek it in Alquati is a dead end. The site of his research is waged factory work, and no amount of wiggling can find more than a cursory, and nearly dismissive, reference to the home or to housewives, leaving the necessary third pole of the città-fabbrica (factory-piazza-home), and therefore of the circuit of capital itself, glaringly absent. Those young forces, whose 1962 “descent” into Piazza Statuto became particularly emblematic, would be talked about plenty. 18 Yet, according to Alquati, all these discussions missed the fundamental notion of class recomposition. However, as composition itself in Alquati’s thought is not a static arrangement of a substance but a process of articulating moments of non-collaboration, recomposition designates, first, a particular relation to the old arrangement (like emerging from inside the previous figure of working class, i.e. Northern skilled labor) and, second, the subjective character of that articulation (when it becomes a project capable of being generalized by a network of struggles). For Alquati, then, to speak of class composition explicitly means working class composition: fittingly for an operaismo approach, it is a partisan perspective concerning the development of a capacity to negate the system that made such development necessary. A process that cannot be untangled from the development of capitalism, it depends on individual lived passages through production that, taken on a class level, make up the actual experience of and resistance to that “transition to production.” Class composition, then, indicates not the makeup of the class at a given moment but the composition of proletarians into a class (“the process of composition (in the sense of constitutive, originary) in the class of workers” [“Notes on a Pamphlet”]). It did not happen once and especially not at a single demarcated period of “real subsumption.” It happens recurrently through the slow recalibrations and “abrupt leaps” of both social struggle and capitalist development. Instances of workers’ non-collaboration with their integration into and fulfillment of the plan, both as quotidian practice of individual creativity (sabotage) and as strikes, wildcats, and stoppages that buck union and factory mediation. Chaining together – “articulating” – this insubordination into a dense, but decentralized and “invisibly organized,” project of social warfare. This is a visible recomposition of class into antagonistic articulation and misuse of capital’s network, not an antagonistic subject, as Negri would have it. For Alquati, the working class is best understood as that collection of moments, and it is the work of inquiry to “better individuate the moments of which the working class at FIAT is composed,” in order to grasp how they communicate and are linked. It isn’t called “invisible” organization for nothing: the moments can be known, but their articulation can only be seen by first drawing out the specific histories of each and only then sketching the diachronic map of class composition. Hours of strike per waged hour. As mentioned before, the particular terrain of this in the post-war decades will be that of the plan of capital, which, for the operaisti designates both a way of interpreting a tendency of capital in general and a specific period – after the Keynesian turn, according to both Tronti and Negri; in Italy specifically, after the war – in which both crises and struggles must be managed, rather than merely surpressed. The plan of capital represents a passage from the standard “planning of development, i.e. a qualititative orientation to development,” to a “neocapitalist perspective, that goes beyond just eliminating the contradictions and uncertainties” and treats development as a quantitative system in which all variables, even proletarian hatred of that system, are calculated as inputs (32). These are, in short, three modes of relation to the plan, modes present at every level of production (rather than managed “from above”): programming posits the unity of specific factory and world, control structures labor-power locally so as to guarantee the plan’s fulfillment, and the organization of labor concerns the link between city-factory, specializing labor (including the “specialization” of being a “generic manual labor”) so as to reproduce its capacity to make use of labor, by binding the overall worker above all to its capacity to labor as defined by factory sector. To be clear, Alquati’s “alternative plan” is infinitely far from the planning logic of social-democracy: like the invisible organization that underlies the wildcat and walk-off, it’s a plan whose “rationality” and strategic perspective is veiled by the fact that it makes immediate demands without submitting a calendar for union and management approval. (Just as the wildcat appears “unpolitical” and non-strategic because it makes no demands.) As with all of his thought, this is a serious defense of the knowledge and foresight embedded in the daily decisions workers make in trying to navigate an alleged rationalized factory. Moreover, it provides a brilliant counter to contemporary over-extensions of “general intellect” embedded in machinery (complex assemblages “not to be confused,” he stresses, with machines themselves). Because for Alquati’s work, the visibility of that intellect, and especially its subversive quality, shows itself nowhere so much as the failure of machinery, or, more precisely, how their function involves a necessarily incomplete rationalization of incorporated workers who find themselves still having to constantly “cheat the system” just to keep it working (thereby putting the burden of continued functionality on them and further imbricating them into production). This counter-plan 24 of non-collaboration “gives expression to the alternative line involved in the response that the executants – workers, employees, technicians – try to give daily, even in individual forms, to the ‘absurd’ (that’s the word that recurs amongst them) conditions of work and life that the progress of neocapitalist exploitation imposes in the factory, a response that moves from the problems relative to their workplace” (32-33). If the counter-plan plan is generated from engagement and disruption of the production process itself (especially taken as one node of the città-fabbrica, that wider network of circulation), what are the historical changes in that node that both heighten this absurdity and create the possibility of countering the plan? This is perhaps the element of Alquati’s research for which he’s best known: dense, close analyses of how the factories of the “large firms,” especially Olivetti and FIAT, function. As the translated sections of the Olivetti article (and the details in the “Struggle at FIAT” essay) give striking examples of this in his own words, I will not attempt to summarize the breadth of his often minute analyses. Instead, in what remains of this introduction, I’ll draw out from his ‘60s essays his models of the division of labor, rationalization, and machinery (as a material history of failed struggles); further discussion of his equally dense work on management, relative surplus value, and information as value will wait for a future commentary. The “mass of machine operators or tertiary assembly line workers [montaggio di terza]. This level doesn’t benefit from any training course, neither, most of the time, from a period of on the job training” (35). “Qualified workers, which FIAT forms in accordance with their needs through six-month professional courses. These are a new type of qualified workers, with a minimum of qualification that the company gives them, for a new type of global operations (and hence not parceled up) brought by technical progress. Therefore these young workers are not going to directly substitute the older ones but have new functions that the old ‘would not know’ how to perform” (35). “Technicians of the new type, the famous polyvalent workers, that FIAT forms directly in the “FIAT School” for the particular way in which production is organized and run. The school lasts three years” (35-36). In addition to forming the basis on which a factory’s management will obscure the totality of its production and, crucially, hide the lags and jam-ups behind a notion of “expertise” that belongs in “another sector” (and hence none of your business), this striation is key because it represents the attempt to form workers in accordance with those different levels and thereby resist the prospect of articulation across an entire workforce. It also means that when the “myth of FIAT” collapses, as it did across all these factories in these years, it will occur at different rates and on different terms for the three sectors, creating in total an antagonistic mass with various specialized knowledges and a complex experience of struggles and production that has to be communicated amongst itself, across those divisions. It’s for that reason that Alquati spends so much time detailing the quite literal passage of information or the word to stop production through workshops and across actual shop floors: those are material instances of the construction of collaborative non-collaboration, the actual linkages from which class composition emerges. It is precisely on this point that Alquati makes his proposal of coresearch (“the hypothesis of a political activity of coresearch”), in the space of that bridge drawn between individual experience and structural contradictions, not through an external analysis or “consciousness-raising” but from those initial spinte of dissatisfaction, anomie, and refusal of the future that FIAT represents and promises: it is “here the young technician finds the political bridge that connects his quotidian personal and social problems to his individual opposition to being exploited at his job” (39). Here, finally, we can grasp one of the basic innovations that Alquati’s work elaborates: that it is precisely capital’s attempt to use the diffusion of management functions and integration into machinery in order to co-opt socialization (its ordinivistico project) and hence render workers in common with each other, whether as work teams or as those who recognize their interchangeability, that creates the conditions for true collective struggle. And – here’s the key turn – so too in reverse. In joining a looser Trontian framework of class struggle as the motor of development with Panzieri’s perspective against technological objectivism, Alquati flips toward a stringent pessimism, demonstrating how the built world of labor, the machines through which value is transmitted, is itself a frozen historical record of this bitterly fought ground between production and negation. The reason to return to Marx 28 is not to revise or overcome Capital, despite the aforementioned fact that Alquati is writing in, and thinking through, a serious scrambling of the working class. One must read Marx because open struggles persist, because the history of proletarian defeats written in machinery cannot be read, and mobilized for future non-collaboration, without an understanding of how neither we nor the bosses themselves can think function without insubordination, the plan without the counterplan, rationalization without the materials of thought it accidentally provides to its hostile executants. However, the form in which these struggles appear are rarely so obvious as a strike, a picket, or a march. Instead, they are a tremendous array of “objective political thrusts” (spinte) that, unlike the machines themselves, must be taken as not decisively coded: they remain “closed” (chiuso) and, in the passage above, “imprisoned” in the system of which they are both expression and potential negation. 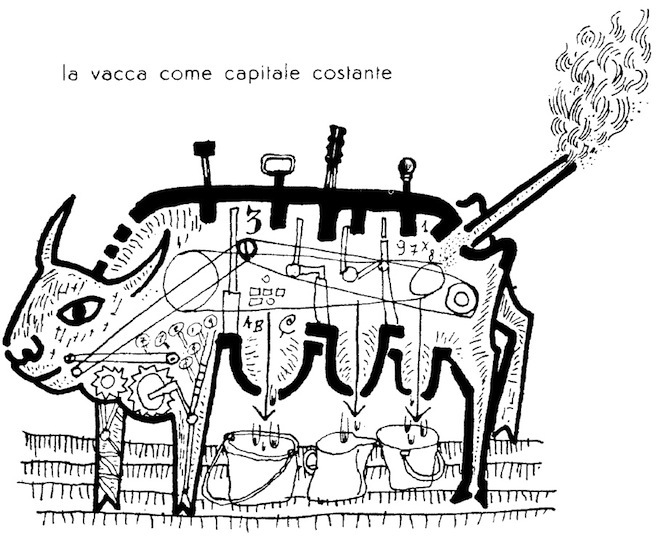 The cow as constant capital. But Alquati would not be the operaisto he truly is without insisting on the bi-directionality of this process and on how the same mechanism provides the tools to hand the plan elements it cannot swallow. The point of that reversal is, paradoxically enough, rationalization itself, the very historical process beneath which fall all the functions of political control he identified. Rationalization is itself the problem, the contradiction that underpins both the frustrated history of revolt and the powderkeg of antagonstic knowledge the factory has been haphazardly storing up in its machinery. 29 The reason is, simply enough, that those same aspects exacerbated by advanced rationalization have made its “classical” objective no longer achievable. And so, if the structure of machinery is a record of failure, the very attempt that defines the era of that machinery’s increasing dominance – the attempt to get workers to fully integrate and fulfill the plan – cuts against this in full, because it still requires the double supplement of both the “myth” of responsibility and the brute coercion of exploitation. It’s in this way that workers begin to sketch out a new mode of struggle, through the circulation of ideas passed through the same channels planned for the accelerated circulation of capital. It is the rare, if not singular, value of Alquati to have grasped this. All the more rare to have grasped how his analyses would “themselves already be a moment of this effort at political organization by the young forces of the working class,” already being worked out in a rigorous and messy process of composition by those who daily use, pore over, fix, and wreck the machinery in which the pre-history of their war is written. 1. ↑ All illustrations originally appeared in Classe Operaia, the journal – after Quaderni Rossi – where Alquati’s texts appeared. 2. 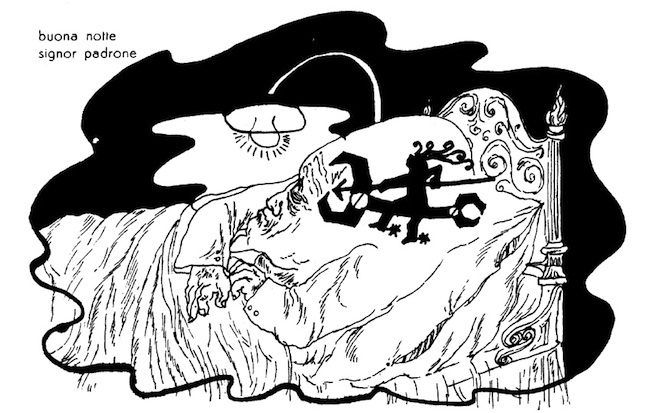 ↑ See the conclusion of this essay for an interpretation of this seemingly odd figure. 3. ↑ Romano Alquati, Sulla FIAT e altri scritti (Milano: Feltrinelli, 1975), 186; further references to this work are given in the text. My translation, as are all selections from Alquati. 4. ↑ On “the autonomy of the political,” see Matteo Mandarini’s essay, “Beyond nihilism: notes towards a critique of left-Heideggerianism in Italian philosophy of the 1970s,” in The Italian Difference: Between Nihilism and Biopolitics. Ed. Lorenzo Lorenzo, and Alberto Toscano. Melbourne: re.press, 2009, 55-79. By that designation, Tronti and Cacciari intend neither autonomia operaia (worker’s autonomy, both a key kernel of classical workerist thought) or autonomia, that diffuse term naming the spatial and theoretical diffusion of workerist theory out of the factory and away from a class-centered perspective of refusal. 5. ↑ Mario Tronti, “Our Operaismo,” New Left Review 73 (January-February 2012): 119-120. 7. ↑ Murphy’s translation in Books for Burning, 259. 8. ↑ It’s somewhere between a sign of impressive restraint and a bummer that he never fully owns those spinte. One can feel a smoldering will to negation just below the surface of his extremely measured eviscerations of the unions, and I can’t be alone in cheering him to posthumously let it rip. 9. ↑ For the record, in my translations, I have preserved this as much as possible. Where I find that it would make the texts even harder to grasp than they currently are, I’ve made necessary changes to structure. 10. ↑ Their self-description, as noted in the “Report”: “that’s the word that recurs amongst them” (33). 12. ↑ This same unity of style and analytic practice lies too behind that strange mix of sociological dryness with the flares of revolutionary will that push his thought toward more openly insurrectionary territory. It is an expression of the grounding condition of his thought, which urged again and again that the gulf between analysis and insubordination was a pure mystification, even if rejecting that gulf – as he did – necessarily meant crossing, and letting oneself be closed within, enemy territory: the actual mechanisms of capital, the thick circuits of relation between constant and variable capital. 13. ↑ See my translation of “Struggle at FIAT” for Alquati’s discussion of ordinivismo. 14. ↑ Antonio Gramsci, “Unions and councils,” L’Ordine Nuovo, 11 October 1919. 16. ↑ Worth noting: the word Alquati uses is programmatorie, which could also be translated as “programmatist,” putting the work in potentially interesting dialogue with Théorie Communiste and others. 17. ↑ Passaggio, also meaning “transition,” a key word for his writing. 18. ↑ Even if its role was more as myth: Dario Lanzardo, for instance, has pointed out that at the particular FIAT plants behind the strike, there were very few Southern-born workers (at this time). As for the riots, it is far from clear that it was the workers themselves who made up the majority of the hell-raisers: it seems to have been primarily youths (which can include workers) and proletarians from the neighborhood. See Dario Lanzardo, La Rivolta Di Piazza Statuto: Torino, Luglio 1962 (Milano: Feltrinelli economica, 1979). 19. ↑ My emphasis – ECW. 20. ↑ Reference to one part of Marx’s three-part model of machinery (motive force/transmission mechanism/tool) and echo of Tronti’s emergent position of working class resistance as the motor of capitalist development. 23. ↑ He insists that there can be no squaring of these two models: “It’s therefore necessary to refute and destroy the business pyramid that industrial sociology presents us and to recompose it with other hypotheses. The three functions that we defined as bureaucratic are a first approximation of the actual form of class exploitation in the relations of production” (112). 24. ↑ Contropiano: a term that would be picked up again by the journal Contropiano and by Silvia Federici, among others. 25. ↑ Mirafiori, the most “advanced,” is the site he most extensively considers, much as the Olivetti factory shows further advances of its own type (moves toward the cybernetic, complex sectoral “disproportionality,” a much-vaunted humanist paternalism, etc). 26. ↑ He continues: “it’s the promise of passing “to the first” [i.e. the more advanced lines of work”] that crumbles in the face of the mass of workers who’ve already been waiting ten years in the factory for this passage” (40). 27. ↑ “They enter ‘on the third’ [the lowest classification of labor], they remain for a good chunk of time under the impression of the big paternal politicians of the early days, but when they come to grips with the fact that the category passage [to the 2nd or 3rd line] isn’t coming, ‘they strike the first sparks,’ because these young hires don’t resign themselves like the old ones “who built up the callous,” many now having already worked outside for a year or two and were declassified [i.e. bumped down the ranks] by FIAT, etc.” (41). 28. ↑ A return which in this case will mean the adoption of a categorical language, particularly focused on grappling with the junction point of constant and variable capital. Evan Calder Williams is the author of Combined and Uneven Apocalypse; Roman Letters; Shard Cinema; and, forthcoming, The Grid Aflame. He is the translator, with David Fernbach, of Mario Mieli's Towards a Gay Communism. He teaches theory at the Center for Curatorial Studies at Bard College and film production at Cooper Union. He is the cofounder of Thirteen Black Cats, a research and production collective for moving images, and is a member of the Viewpoint editorial collective.